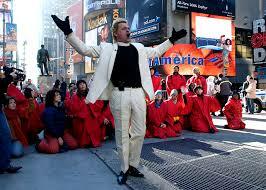 Reverend Billy and The church of stop shopping are critical of our addiction to shopping – especially at Christmas. They suggest we are facing a ‘Shopocalypse’ – arguing that over consumption fuels the debt crisis, global warming and destroys local economies and communities if products are purchased from TNCs. Instead, they suggest that we should use Christmas as a time to develop positive new low-consumption habits – learning to be happy with less! The video below – ‘What Would Jesus Buy’ is an excellent documentary outlining their ‘activist performance art’ and their general critique of consumption at Christmas. The Church uses its performance art to protest more widely than just at Christmas – they target unethical companies, such as banks who fund logging in the Rain Forest, and target their lobbies to protest their involvement, and get arrested a lot in the process! Linking to sociological theories… the Church is coming from a broadly leftist, Marxist perspective in its criticisms of our consumption habits. Linking to Crime and Deviance – obviously what they are doing is deviant! More interestingly, it’s interested to note how their dealt with by the state – during many of their protests, they get arrested, spend a night in jail, then they’re back out again… while the far more harmful practices of the Corporations they protest against just carry on. These activists are protesting what they see as ‘Green Crimes’ – companies which harm the planet, but of course these acts are not defined as such by the state. Linking to the Family – Personal Life Perspective maybe? Linking to Education – well it’s educational! And linking to religion – I dunno, I’m a bit confused about this! Possibly nothing at all? And don’t forget to slow down your consumption, Ahmen! Although it’s possibly too late for that…?